The Mazdaspeed 757 are JDM Wheels made specifically for Mazda’s as the name implies. 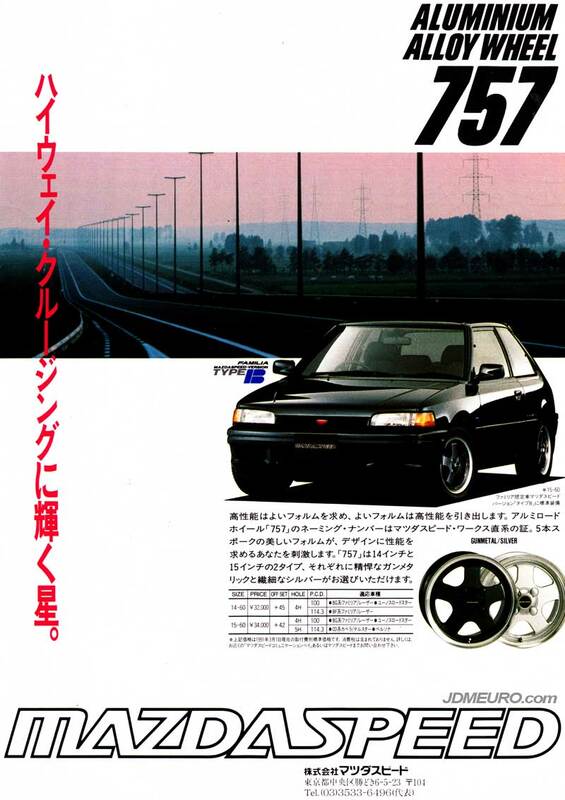 The Mazdaspeed 757 feaure a 5 spoke design but only available in 4 lug configurations, either 4×114 pcd or 4×100 pcd. Pictured are the 757’s mounted on a Mazda Familia Mazdaspeed Version Type B. Being available in 4×100 means they could be had for a Mazda Miata! Mazda Miata NB on Brock B1 Wheels - Peachy! I have these on my Roadster 🙂 mail me if you want pics.